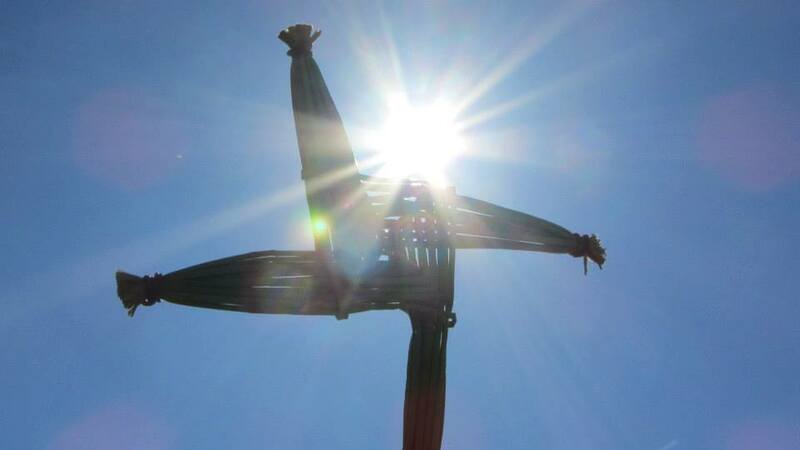 The cross woven of reeds at the heart of the swan is the symbol of Brigid and is traditionally made at the Celtic Festival of Imbolc (meaning in the belly) at Springtime, 1st February, when the lambing season begins. This equilateral cross speaks of the connection of the 4 directions of North, East, South and West with the centre uniting Heaven and Earth through the Source of All/Spirit of Love/God/Goddess. It is the symbol of Brigid, known to some as a Christian Saint and others as a Goddess of Ireland. The Swan part of the logo comes from Anthony Murphy’s discovery in his book ‘Island of the Setting Sun’ of the Cygnus Constellation that ‘flew’ in the sky from Faughart, in County Louth to Kildare town in County Kildare at the time of St Patrick. 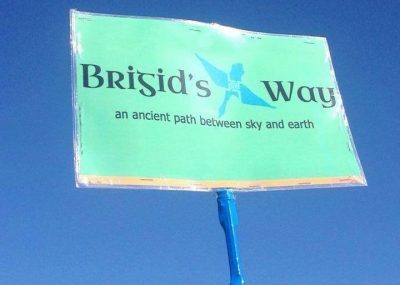 Dolores and Karen found out from wonderful people as they walked the route that it covers the ancient pilgrim path linking these two iconic sacred sites of Brigid in Ireland. The logo was designed by Bernie Sexton, using the colours of blue and orange because of Brigid’s association with water and fire in her sacred Wells and Fire Temple. The Logo has been incorporated into the banners that we carry throughout the pilgrim.